This is a scripture that every parent should heed, but few do. 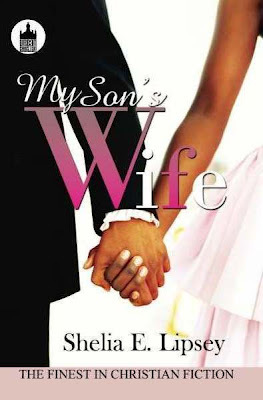 Inside the pages of My Son’s Wife, the latest page-turner from author Shelia Lipsey, readers will come face-to-face with the bi-product of parental neglect. For First Lady Audrey Graham keeping up appearances is her ministry. If they can see it they can achieve it seems to be her personal mantra. For all intent and purposes she is the consummate first lady in every sense of the word, or is she. As you are given a look inside the private life of the Graham family, the façade of perfection begins to lose its luster. Stiles has followed in his father’s footsteps and will soon ascend to the pastoral throne. His sister Francesca is a mystery no one, but her best friend Rena understands. When Rena and Stiles become engaged, the lid on the pot of Francesca’s questionable past and present threatens all that their mother holds dear. Author Lipsey is to be commended for presenting a work with subject matter most do not touch beyond superficial means. With skill she opens eyes to that which statistics is showing as growing at an alarming rate within the Christian community. Equal skill is applied to addressing the subject in a way that will provoke readers to thought and possibly reassessing how they may have or are currently treating those considered to be – not the norm. It is this reviewer’s hope that there will be more authors stepping out of the shadows to present works of standards that speak to the social ills most refuse to touch. Linda, what a dynamite article and review! Although I am the author of My Son's Wife, your ability to go in depth and pull the core ideas behind the story and within the story are amazing. Thank you for taking the time to read, My Son's Wife. It is my prayer that others who read it, will gain the knowledge, insight and the Godly principles as well. Thank you to all of you who will be moved and touched by My Son's Wife. To God be the glory, honor and praise!